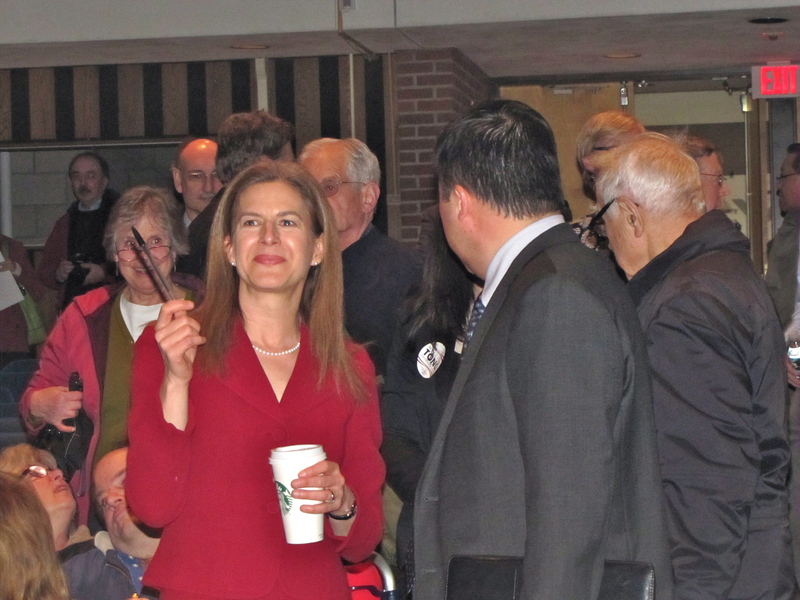 Former Secretary of the State Susan Bysiewicz confirmed Wednesday what has been apparent from her aggressive fundraising: What began in April as an exploratory campaign for state Senate has morphed into a test of her viability as a candidate in a Democratic primary for governor. Comptroller Kevin P. Lembo made the surprising announcement on Aug. 31 he would not pursue a campaign for governor, and Lt. Gov. Nancy Wyman seemed unlikely to run. Not long after, Bysiewicz said, Attorney General George Jepsen and Secretary of the State Denise Merrill gave an encouraging assessment of her chances to win. Wyman confirmed in November she would not try to succeed Gov. Dannel P. Malloy, who is not seeking a third term. Hartford Mayor Luke Bronin opened an exploratory in early December and says he already has raised more than $100,000. Ned Lamont, who ran an insurgent campaign against U.S. Sen. Joseph I. Lieberman in 2006, confirmed Tuesday night he is polling in preparation for deciding in the next few days whether to run. Lamont and Bysiewicz would give the Democrats two candidates who have won statewide primaries, Lamont in 2006 and Bysiewicz in 1998. Beginning that year, Bysiewicz won three statewide races for secretary of the state. Her career imploded in 2010, when she seemed poised to enter the open race for governor as the frontrunner. Instead, she ran for attorney general, only to be told by the Supreme Court that she did not have the experience required by state law to hold the office. Bysiewicz decisively lost a primary for U.S. Senate in 2012 to Chris Murphy. She said her exploration of making a comeback by running for state Senate in the 13th District, which stretches from Middletown to Meriden, was no feint, even if she raised $32,683 dollars — double what a candidate needs to qualify for public financing in a state Senate race — in her first three months. Bysiewicz began door-to-door campaigning in July after filing her first finance report, eventually reaching 10,000 homes, she said. She started in Meriden, the home of the Republican incumbent, Len Suzio. At the time, Bysiewicz lived a block outside the district lines in Middletown, a community split between the 13th and 9th Senate districts. Bysiewicz said she and her husband, now empty nesters with their children out of college, closed on a home in December on a Middletown street just inside the 13th. All those actions, she said, point to a woman serious about a potential run in the 13th District, which she says is still possible. She said she stepped up her fundraising to be in position to qualify for public financing should she go for governor. Qualifying for public financing for governor requires raising $250,000 in donations of no more than $100. She said she has raised about $145,000. Whatever she decided, Bysiewicz said, the only offices she is consider are state Senate or governor, none of the other open statewide offices. Democratic candidates include Middletown Mayor Dan Drew and Bridgeport Mayor Joseph P. Ganim. Two candidates who never have held elective office, former Veterans Affairs Commissioner Sean Connolly and a former corporate executive, Guy L. Smith IV, declared their candidacies Tuesday. Jonathan Harris, a former state senator, Democratic state party executive and consumer protection commissioner, says he has raised $232,000 in his exploratory campaign, with nearly 90 percent of the money coming in contributions of no more than $100. Exploratory campaigns can accept a maximum of $375. Once a candidate terminates an exploratory committee and declares for office, contributions of up to $100 generally can be applied to the qualifying threshold for public financing. The deadline for filing campaign reports for the final quarter of 2017 is midnight Wednesday.